Reflex Photonics will conduct live demonstrations of its new LightCONEX 300G Active Blind Mate Optical VPX Interconnect solution at the upcoming Optical Networking and Communication Conference & Exhibition (OFC 2018). 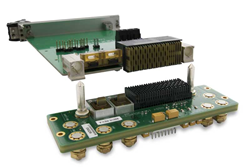 This new module features 12 full-duplex lanes (12+12) offering an aggregated bandwidth of up to 300G in a unique, rugged, small-SWaP, low-cost module, meeting VITA 66 standards. This new module features 12 full-duplex lines offering an aggregated bandwidth of up to 300G in a unique, rugged, small-SWaP, low-cost module, as specified in current and upcoming VITA 66 standards. LightCONEX is the first optical interconnect solution to meet the needs of high-bandwidth optical interconnects in the super competitive high performance embedded computing market. The LightCONEX solution frees up board space by integrating the optical transceiver into the board edge of the plug-in module connector. The backplane connector, also part of the LightCONEX solution, has a spring-loaded mechanism ensuring optimal optical mating as required in VITA 66.0 standard. The rugged construction of these connectors ensures error free data transmission under severe shock, vibration, and temperature extremes. The new LightCONEX 12-lane full-duplex transceiver operates at up to 12.5 Gbps per lane over a temperature from -40°C to 100°C and occupies a very small volume and a footprint of (L×W×H) 32 × 14 × 5 mm. The LightCONEX is also offered as a 12-lane transmitter or receiver, as well as a 4-lane full-duplex transceiver. The LightCONEX finds applications in optical backplanes, routers, switches and VPX systems, like those deployed in high-performance embedded computing systems for civilian and military command and control (C4ISR) systems. "Today's high-performance computers demand numerous high-bandwidth optical interconnects that uses the least space at the lowest system cost. LightCONEX is the first optical interconnect solution to meet these needs in the super competitive high performance embedded computing market. The LightCONEX 12+12 represents a remarkable feat of engineering that illustrates once more Reflex's mastery of advanced optical design. This module offers market leading I/O density and satisfies the most stringent SWaP requirements with a minuscule PCB footprint and volume." You are invited to see a live demonstration of the LightCONEX 3U VPX interconnect solution and other Reflex Photonics products such as the LightABLE rugged transceiver, LightVISION industrial transceiver, and LightSPACE radiation hardened transceivers, as well as SNAP12, QSFP, and CFP modules. Come visit us at OFC 2018, Booth #5731 from March 13 to March 15, 2018.